I vividly remember the time when the hubby and I were talking about renovation plans for our previous house. He suggested installing a ceiling fan in our living room and my first reaction was "Noooooo, I don't think it will be aesthetically pleasing at all." You see, I've never used a ceiling fan at home in my life at that time and somehow, it just reminded me of a boring classroom setting. In my mind, I was so sure that it wouldn't look nice and would instead look unappealing and out of place. Nonetheless, I relented and we ended up with a ceiling fan in our living room. I must tell you, it actually turned out to be one of the best decisions we made. Yeah, not only did I concede defeat, my view on ceiling fans also took a 180 degree change. Now, five years later since we've lived with ceiling fans, I seriously don't think we can survive in our new home without them! Why, you may ask? Well, they make the unbearable hot and humid weather easier to bear, they save the need for air con and high electricity bills, they cover a wide area while taking up zero floor space, they are easy to operate and adaptable to your needs, and contrary to what I first thought, they can be sleek in design and complement the theme of your home too. We have a stand fan that has withstood the test of time through the years and proved to us that it was a brand worth believing, and investing, in. Yes, it is a KDK stand fan that is around a decade old and still going strong - in fact, it was the oldest yet strongest of the many stand fans we owned previously. 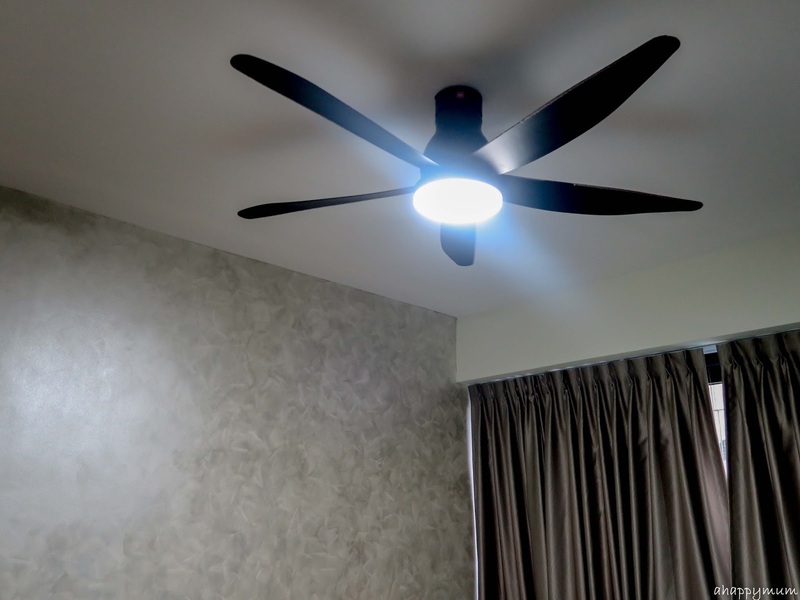 So, I felt honoured and happy to be given the chance to work with Capital Distributors, the sole distributor for KDK fans in Singapore, for our new house and this time round, we installed ceiling fans not just for the living room, but for our bedroom as well. 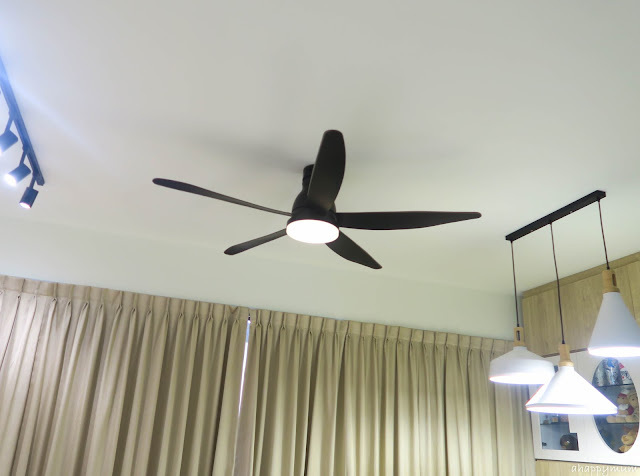 For both the living room and master bedroom, we installed the U60FW - a remote controlled ceiling fan that has a DC motor and measures 60 inches (150cm) in diameter. As one of its latest models, the U60FW is the first KDK ceiling fan that offers a choice of black in colour. Considering that our Scandinavian themed living room consists of black track lights and black panel/cord for the dining light, black was the natural choice for us. 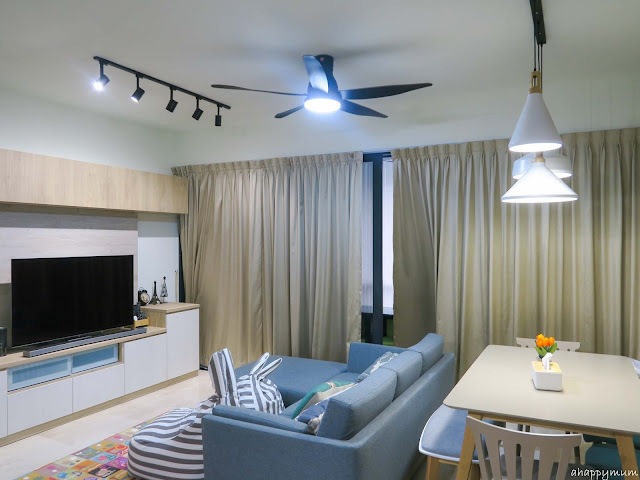 See how the fan fits in nicely in the middle of the living and dining areas? Yes, that made it totally worthwhile to go through the huge hassle of drilling the ceiling for an additional electrical point. So far, we have been using the ceiling fan for over a month and are totally satisfied with its performance. Here's sharing five reasons on what we love about the U60FW. 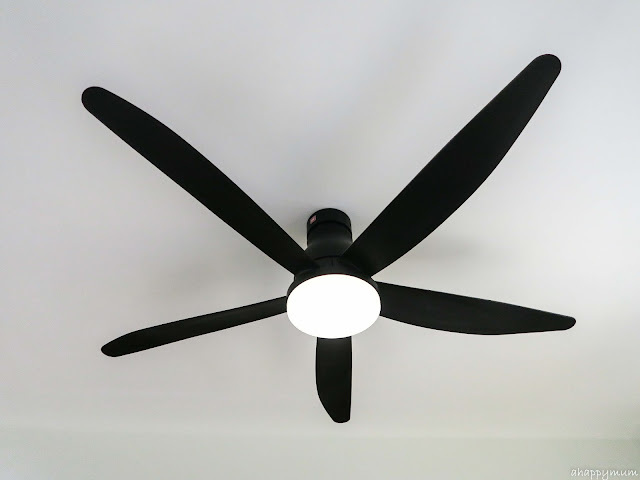 Unlike the ceiling fan we had previously, the U60FW features blades that look way more modern and stylish. The blades may be slim but they can create powerful, strong yet smooth winds once they start to spin. The use of the LED light adds to the functionality of the fan yet it looks trendy and remains visually appealing. Our previous fan made use of light bulbs which had protruding bulb holders, so this LED one was a complete change and I totally loved it. There is a total of 9 speeds (Yes, you read right, NINE!) to choose from and you can easily adjust according to your preference, weather or time of the day. I have to say that the wind is really quite strong so we usually don't even need to hit the high speeds and yet the breeze is enough to cool the house. So, we wanted a fan that also comes with a light because it just makes things so much easier, right? This way, we do not need to create an extra electrical point on the ceiling in our master bedroom (which only has one). The LED light comes with three levels of brightness: White, Cool Daylight, Warm. 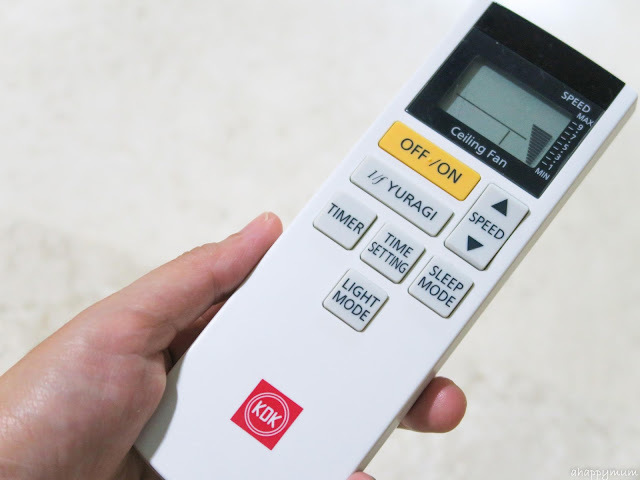 It also goes to a dim warm colour before turning off completely and this comes in very handy for us during our family movie nights in the living room where we will switch off all other lights and leave this dim light on. Never heard of it, right? So didn't I until we received this fan and I was intrigued to see this labelled on one of the remote control buttons. By the way, the remote control is very user-friendly and the best thing is that if you have more than one fan installed, you can use the remote control to control any of the fans. Previously, we had to use a pull chain switch for our fan and let's just say it was a huge hassle and there was always the risk of the chain breaking. So, having a remote control fan makes things much easier for us, especially now that our ceiling is now over 2.7m high. 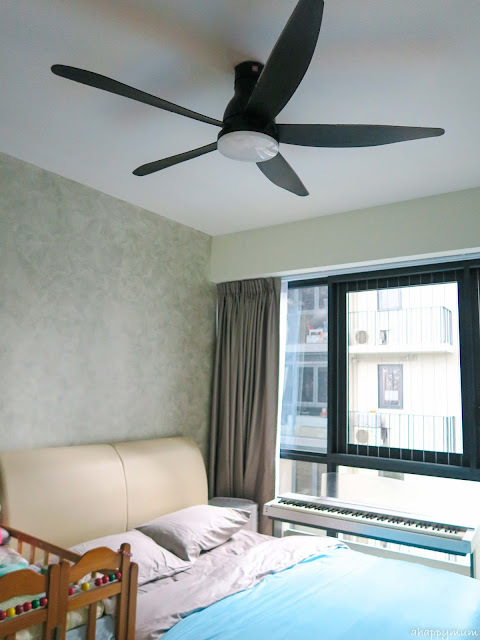 If you take a look at our ceiling fans, you will realise that the one in the master bedroom is right above the bed whereas the living room one is right above the sofa. Even if it seems very unlikely, being a mum still makes me a little paranoid as to whether one day the screws will loosen and the fan might just fall right down. 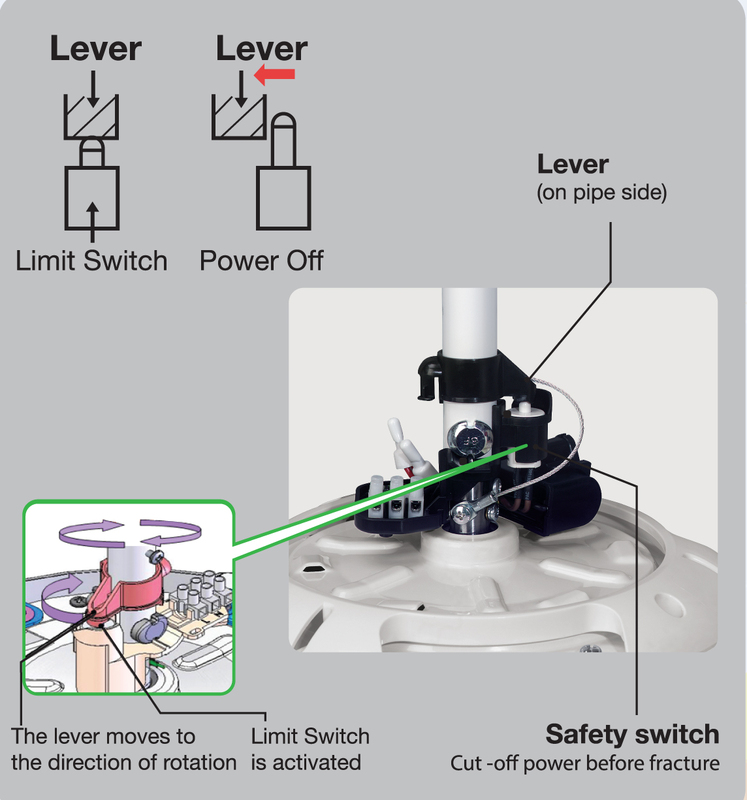 KDK ceiling fans feature the world's 1st Patented Safety design that incorporates a safety plate/hook that keeps blades from falling, a safety switch that automatically cuts off power when it detects any shaft or bolt damage, There is also a safety wire that secures the fan motor to the ceiling hook and a thermal safety fuse to protect the motor from power surges. So, even if the screws were to become loose and the fan drops down one day, the safety precaution will ensure that it only dangles from the safety wire instead of collapsing onto the floor/bed/sofa. Every mum's wish is for her kids to be safe. This unique safety feature helps me feel more assured knowing that my kids won't be hit by a falling fan with its heavy, powerful blades and gives me a peace of mind when I go to bed. 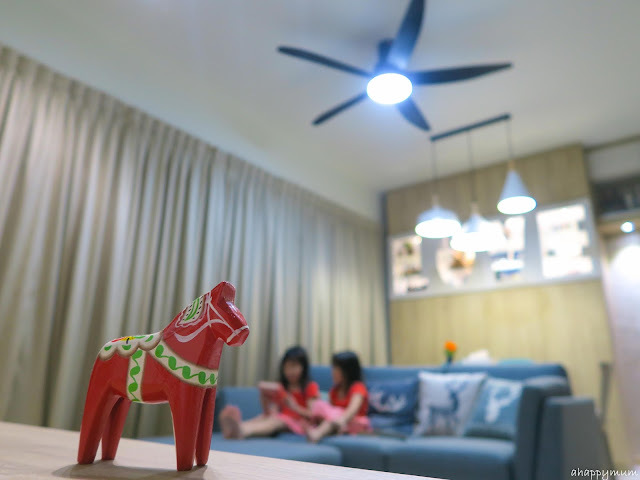 Note that only Singapore KDK Models bear the Spring Singapore Safety Mark, which certifies that the products meet stringent safety standards and are 100% safe for use in your home. For the record, yes, ceiling fans are now considered a necessity and likely one of the most functional and frequently used appliances in our home. So, I'm just feeling very thankful and relieved that our new home is now equipped with KDK ceiling fans that we love and trust. Disclosure: This is Part I of a two-part post in collaboration with Capital Distributors and we received a KDK U60FW in writing this review. All photographs and opinions are our own.